The Chablis series is noted for its serene combination of rounded and rectangular shapes. These durable steel 32 in x 80 in pre-hung entry doors will enhance the value and beauty of your home. Double bored, the door can accept a lock set and deadbolt of your choice. Inspired by the great architectural traditions of the 20th century, the Chicago series offers you a classic look for your homes entrance. These durable steel 32 in x 80 in pre-hung entry doors will enhance the value and beauty of your home. Double bored, the door can accept a lock set and deadbolt of your choice. Delight in how the geometrically pure Seattle glass lite series brings character, transparency and dynamic reflections to your entryway. These durable steel 32 in x 80 in pre-hung entry doors will enhance the value and beauty of your home. Double bored, the door can accept a lock set and deadbolt of your choice. 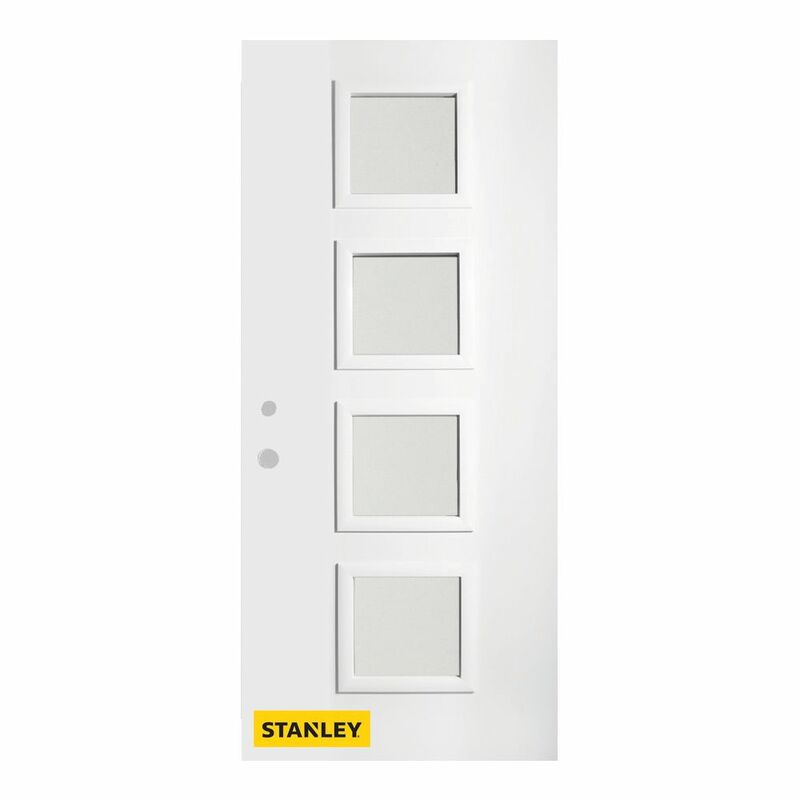 35.375 inch x 82.375 inch Evelyn 4-Lite Carr Prefinished White Right-Hand Inswing Steel Prehung Front Door - ENERGY STAR® Stanley's Retro Collection of steel doors is definitely style-driven. These doors' retro style is both classic and current, while their performance is at a level that only a Stanley Door could provide. Their enhanced door lite frame adds an Art Deco appeal and further lends to their retro feel. For an entrance door that is both elegant and understated, choose this Satin Opaque glass. It offers a high level of privacy, while still allowing just the right amount of light in. This model is simple and classic and is sure to please any homeowner. Actual colours and appearance may vary slightly from image due to lighting.